Andrew Bailey is a scholar, artist, and curator who lives and works in Toronto, Ontario. Currently he is in the process of completing a PhD in Art History and Visual Culture at York University with research centred around how history and nostalgia relate to both game art and game studies. In the decade following the release of Resident Evil 4 (2005), each successive entry within Capcom’s flagship horror series became more focused on producing action set pieces rather than genuine scares. 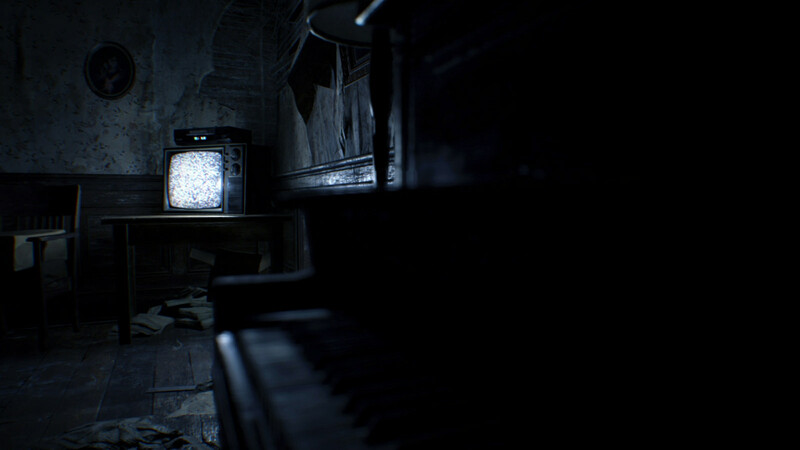 This all changed with the release of The Beginning Hour, a short demo released in 2016 for the then upcoming Resident Evil 7: biohazard (2017). This essay will examine how The Beginning Hour marks the Resident Evil series’ return to the survival horror genre through the appropriation of tropes and aesthetics from horror cinema, the history of the Resident Evil series, and—most significantly—the forms and marketing used in Hideo Kojima and Guillermo Del Toro’s now ghostly P.T. (2014). By doing all of this, I argue that The Beginning Hour exists as a collapsing of horror history that functions experientially through its looping gameplay, as well conceptually through its referential relationship with media of the past. To support these arguments I will combine Bolter and Grusin’s concept of remediation (2001)—a notion that all new technologies contain and transform the media that came before them—with Derrida’s theory of hauntology (1994)—a portmanteau of haunt and ontology meant to describe how history can pervade the present. Though the similarities between the two are numerous, there is one key difference between The Beginning Hour and P.T. : due to the cancellation of the game it was intended to tease, P.T. is no longer officially distributed and exists only as a residual artifact on a dwindling number of hard drives. 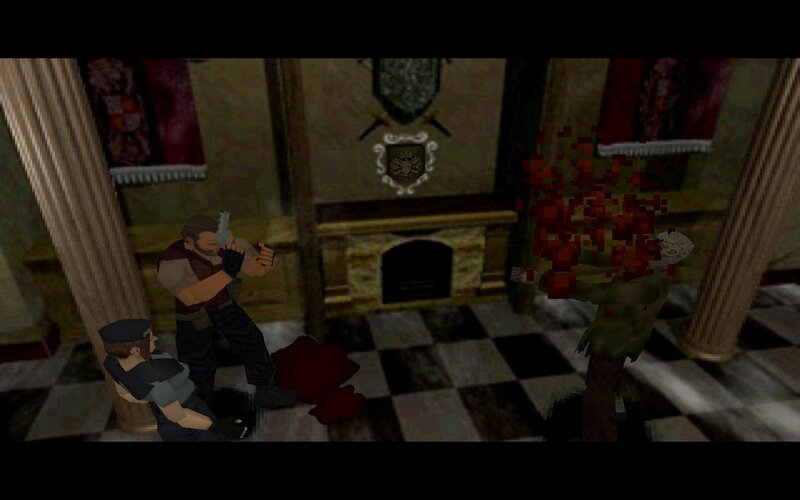 This means that whether it was intentional or not, The Beginning Hour will always be haunted by the spectral shadow of P.T..
A still image from Resident Evil (1996) showcasing the game’s third-person perspective. Non-Player Character Barry Burton dispatches a zombie. Interferes with player performance by taking away the power to see what is coming and removing a player’s ability to read real space… Unnerved and blinded, unable to act as efficiently as would be expected, this tallies with the use of tropes of claustrophobia found across Horror and Gothic fiction to stimulate affect to produce sensation and emotion (296). Despite its success at inducing scares, the fixed camera system fell out of vogue within the survival horror genre and was gradually replaced with an over-the-shoulder perspective that allowed for easier action gameplay. The Resident Evil and Silent Hill series were not alone in this move towards ease and accessibility—many other popular horror games such as Dead Space (2008), Alan Wake (2010), and The Evil Within (2014) were also focusing on empowering gunplay and more fluid movement mechanics. In popular games criticism circles, many saw this as a broader change in design paradigms that meant the end of traditional survival horror (Yin-Poole; Bleszinski), yet these shifts in the AAA space were not indicative of the genre as a whole. First person indie games like Slender (2012) and Amnesia: The Dark Descent (2010) that contained no combat mechanics became commercially successful due to the way their lack of defensive options would prompt dramatic, crowd-pleasing reactions from popular Twitch and Youtube streamers. In a paper on remediation within the Resident Evil series, Ewan Kirkland argues that the fixed camera systems of early survival horror represent an appropriation of the cinematic, explaining this was done in order to communicate a sense of authenticity and realism that was otherwise absent from the wholly computer generated worlds of video games (118). As time passed however, the logic of these cinematic remediations needed to be reworked as trends within popular horror film shifted towards found footage film and handheld camera perspectives. Slender and Amnesia are pioneering examples of this change, and P.T. represents one of the first AAA ventures into this new territory. Using Bolter and Grusin’s terminology, Kirkland declares that this kind of first person illusionism—where the technology is attempting to hide itself through immersion—creates a kind of “immediacy” that is at odds with the inherent “hypermediacy” of video games. Kirkland explains that “hypermediacy” is an effect of remediation where the combination of various media is made explicit to the audience and that video games produce this effect naturally through the digitextuality of their interface, HUD, menus, etc (117). Whereas P.T. can most easily be categorized as aiming for an “immediacy” of verisimilitude and embodiment, it does also contain some “hypermediate” elements through its use of glitchy visual effects and non-diegetic text. 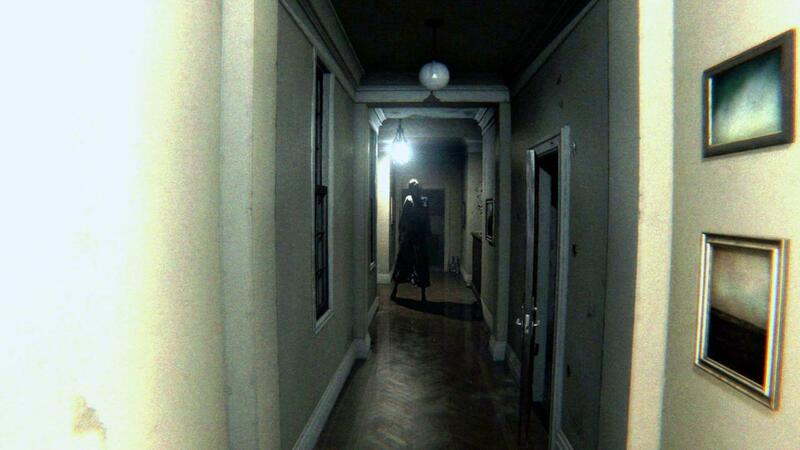 In P.T., the player turns a corner, only to be confronted by a silhouetted character down the hallway. Although P.T. was considered to be enormously successful at reinvigorating interest in the aging Silent Hill series, the project was cancelled due to a widely publicized parting of ways between Kojima and publisher Konami. Additionally, as an after effect of this cancellation, P.T. was removed from PSN and became inaccessible to those who did not already have a copy of the game saved on their Playstation console. Turning back to Derrida and his concept of hauntology, I argue that this act of cancellation shifted P.T. from having existed wholly in the present, defined by the positive potentiality of the Silent Hill game it was meant to tease, to a new state in which it only exists partially as a kind of spectre, defined by the lost potential of a game that will never exist. In his book on hauntology within popular culture, Mark Fisher describes the figure of the spectre as being important because “it cannot be fully present: it has no being in itself but marks a relation to what is no longer or not yet” (18). Through its partial status and inherent relationship with a cancelled project, P.T. easily fits into Fisher’s temporal definition of the spectre. Additionally, to further elaborate on his phantasmic concept, Fisher explains that the spectre is only able to remain within the present through artificial means, and through this false presence generates a compulsion to repeat or copy itself (18). Looking at independent projects like Lilith Ltd’s Allison Road (in development) or Kitty Horrorshow’s Anatomy (2016), it is easy to see that the spectre of P.T. did in fact generate a mimetic compulsion with the survival horror community. With this level of influence in mind, it not surprising that Capcom took cues from P.T. with their design of The Beginning Hour, even if they have repeatedly asserted that these similarities are nothing more than mere coincidence (Buttersworth). 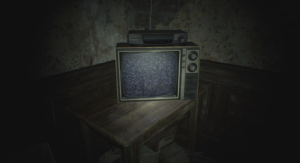 A television with a VCR on top sits on a table in the corner of a dark room. The television only displays static. The similarities between P.T. and The Beginning Hour go beyond just the shift from third person combat to first person exploration. Hauntology and remediation are useful for conceptualizing the uncanny resemblance between The Beginning Hour and P.T. : both games are constrained experiences that take place within the tight confines of a locked house. Both games also force their players to move through domestic environments with no way to defend themselves from the malevolent entities lurking within, besides hiding or running away. In P.T., this consists of an initially normal house that becomes increasingly disturbing each time you complete a looping set of cryptic puzzles. Although The Beginning Hour varies slightly by placing you within a house that is explicitly hostile from the start, it similarly constructs its main gameplay experience around the idea of looping domestic exploration. In P.T., once you complete a puzzle the house undergoes a kind of supernatural reset with increasingly frightening changes made with each successive loop. The Beginning Hour emulates P.T.’s looping structure, but uses a slightly different method—one that emphasizes the same “hypermediacy” that Kirkland identifies as being a tool to construct an otherwise absent feeling of realism. In the original Resident Evil, Kirkland argues that typewriters and other obsolete technology were included to make the virtual environments seem more authentic and add a confessional weight towards the non-diegetic act of saving your game. Broadening his scope he goes on to explain how this is a common tactic within the genre stating that “many horror games explicitly evoke associations between media and the occult, using old media technological artifacts…as signifiers of a ghostly, evil, or threatening presence” (117-122). Within P.T. the remediation of older media is subtly achieved through glitchy visual effects and crackly radio signals. The Beginning Hour, on the other hand, emphasizes its “hypermediacy” more obviously by forcing players out of the game’s current reality into the recorded past of staticy VHS tape that must be watched to progress through the demo. Significantly, this sequence is not a non-interactive cutscene, but a fully playable part of the demo that when completed will reveal a potential path of escape from the house you are trapped within. Once you finish with the “hypermediate” camera reality and are placed back in the more “immediate” optical reality of your player character, you must loop through the same set of actions and spaces that you just did within the VHS tape. Not only does this use of looping puzzles create another link between The Beginning Hour and the spectre that is P.T., but it also creates its own unique kind of hauntology through the temporal disjunction the VHS sequence implies. Kirkland describes how “horror video games’ emulation of white noise, photographic blurring, and celluloid imperfections produces the uncanny impression of an older, ghostly or undead analog media seeping into, contaminating and enveloping the digital” (123-124). In the case of The Beginning Hour, the night vision colour and washed out lighting of its VHS play sequence not only remediates older technology for the purposes of realism, but also emphasizes a thematic focus on looping time and repeating histories. This neatly places The Beginning Hour in the same hauntological realm as P.T., but also compounds the effect by inextricably tying it to the past. As its title vaguely alludes to, The Beginning Hour is a game in which time plays a crucial role. This occurs through the way it treats obsolescence in its remediation of VHS technology; but also through the way that it attempts to loop back into an exterior history of horror by way of quotation, reference, and emulation. The Beginning Hour playfully nods to reality through its verisimilitude, but ultimately exists wholly outside of it through a nostalgic collapsing of time. Like the house you are trapped within, The Beginning Hour is a place where time is out of joint, where you must play through a recorded experience made in reference to a spectral demo that is sadly “no longer” for a game that is forever in a state of “not yet”. In this way The Beginning Hour’s title also references how it is stuck in a perpetual state of beginning, hauntingly defined by its origins, its history, and by the lost spectre of what could have been. Alan Wake. Remedy Entertainment, 2010. Video game. Amnesia: The Dark Descent. Frictional Games, 2010. Video game. Bleszinski, Cliff. “Dead Space Started Off As Horror, But Now It’s So Much More” Kotaku, March 12, 2013. Bolter, Jay David, and Richard Grusin. Remediation: Understanding New Media. Cambridge: MIT Press, 2001. Buttersworth, James. “Resident Evil 7 Producer Explains What the Full Game Will Actually Be Like” Gamespot, June 16, 2016. Dead Space. Visceral Games, 2008. Video game. Derrida, Jacques. Spectres of Marx. Routledge, 1994. Kirkland, Ewan. “Resident Evil’s Typewriter: Survival Horror and Its Remediations.” Games and Culture, vol 4, no 2, 2009. 115-126. Krzywinska, Tanya. “Gaming Horror’s Horror: Representation, Regulation, and Affect in Survival Horror Videogames.” Journal of Visual Culture, vol 15, no 3, 2015. 293-297. P.T.. Konami, 2014. Video game. Resident Evil 4. Capcom, 2005. Video game. Resident Evil 7: Biohazard. Capcom, 2017. Video game. Silent Hill. Konami, 1999. Video game. Slender: The Eight Pages. Parsec Productions, 2012. Video game. The Evil Within. Tango Gameworks, 2014. Video game. Yin-Poole, Wesley. “Capcom: survival horror market too small for Resident Evil” Eurogamer, March 23, 2012.